What is Verticillium wilt? Verticillium wilt is a typically fatal disease that affects a wide range of deciduous woody ornamentals in Wisconsin. Trees most commonly and severely affected are maple and ash. Other trees and shrubs such as barberry, catalpa, elm, lilac, linden, smoke-tree and redbud susceptible. In addition, many herbaceous ornamentals, as well as vegetable crops (see University of Wisconsin Garden Facts XHT1146 “Vertcillium Wilt of Vegetables”), can be affected by this disease. Sudden yellowing, wilting and death of leaves and branches, particularly starting in one section of a tree or shrub, is a typical symptom of Verticillium wilt. What does Verticillium wilt look like? The first signs of Verticillium wilt that you may notice are individual branches that suddenly wilt and die. Affected branches may occur on one side of the tree or may be scattered throughout the tree. If you carefully peel away the bark of these branches, you may see brown or green streaking in the sapwood just under the bark. 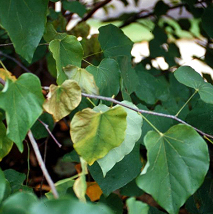 Streaking is common in trees such as maple or redbud, but often is not visible in ash and lilac. Where does Verticillium wilt come from? Verticillium wilt is caused primarily by two fungi, Verticillium dahliae and Verticillium albo-atrum. These fungi are commonly found in Wisconsin soils and in roots, branches and leaves of infected plants. These fungi enter trees and shrubs through their roots and grow in the xylem (i.e., the water-conducting tissue) of plants where they lead to blockage of water movement. This lack of water movement is what eventually leads to wilting. How do I save a tree or shrub with Verticillium wilt? Trees and shrubs infected with Verticillium cannot be cured and will likely eventually die. However, you can extend the life of your plants by making sure that you water and fertilize properly. Make sure established trees and shrubs receive approximately one inch of water per week. If rainfall is insufficient, use a drip or soaker hose to apply supplemental water. Fertilize trees as needed, but be sure to base any fertilization on a soil nutrient test. To prevent competition for water and nutrients, remove lawn grass within the drip line of your trees and shrubs (i.e., the edge of where the branches extend) and replace it with shredded hardwood, pine or cedar mulch. On heavy clay soils, use three inches of mulch. On other soils, use three to four inches of mulch. Be sure to keep mulch two inches from the main trunks and crowns of trees and shrubs. In addition, prune out dead branches as they occur. Dispose of these branches by burning (where allowed by local ordinance) or landfilling them. DO NOT bury or compost these branches. Be sure to clean your pruning tools between cuts by dipping them for at least 30 seconds in a 10% bleach solution or (preferably due its less corrosive properties) 70% alcohol. Rubbing alcohol and many spray disinfectants contain approximately this alcohol concentration. Decontaminating your tools will help prevent spread of Verticillium from branch to branch, or more importantly from tree to tree, as you prune. 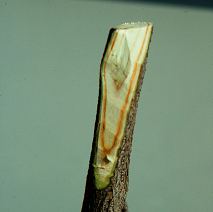 Internal streaking in the sapwood of a branch is typical of Verticillium wilt. How do I avoid problems with Verticillium wilt in the future? The best way to avoid Verticillium wilt is to plant trees and shrubs that are immune or resistant. Resistant deciduous trees and shrubs (as adapted from “Diseases of Trees and Shrubs, Second Edition” by W. Sinclair and H. H. Lyon (Comstock Publishing Associates, 2005)) include apple, aspen, azalea, beech, birch, butternut, crabapple, dogwood, flowering quince, ginkgo, hackberry, hawthorn, hickory, holly, honeylocust, katsura tree, mountain-ash, oak, pear, poplar, sweetgum, sycamore, walnut, and willow. Conifers (e.g., pines, spruces and firs) appear to be immune to the disease. Also, DO NOT use mulches that may have been produced from infected trees or that are of unknown composition. Finally, immediately collect and discard leaves that have fallen from symptomatic trees. Both mulch and leaves are potential sources of Verticillium. For more information on Verticillium wilt: See UW-Extension Bulletin A2537, “Maple and Other Tree Disorder: Verticillium Wilt” (available at http://learningstore.uwex.edu); University of Wisconsin Garden Facts XHT1146, “Verticillium Wilt of Vegetables” (available at http://hort.uwex.edu); or contact your county Extension agent. Thanks to Jean Ferdinandsen, Patti Nagai and Scott Reuss for reviewing this document. © 2019 the Board of Regents of the University of Wisconsin System doing business as University of Wisconsin-Madison Division of Extension. An EEO/Affirmative Action employer, University of Wisconsin-Madison Division of Extension provides equal opportunities in employment and programming, including Title IX and ADA requirements. This document can be provided in an alternative format by calling Brian Hudelson at (608) 262-2863 (711 for Wisconsin Relay). References to pesticide products in this publication are for your convenience and are not an endorsement or criticism of one product over similar products. You are responsible for using pesticides according to the manufacturer’s current label directions. Follow directions exactly to protect the environment and people from pesticide exposure. Failure to do so violates the law. A complete inventory of University of Wisconsin Garden/Farm Facts/Pest Alerts is available at the University of Wisconsin-Madison Division of Extension Plant Disease Diagnostics Clinic website: https://pddc.wisc.edu. Take our customer satisfaction survey.